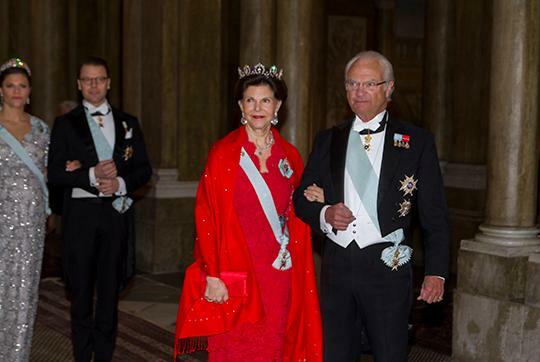 King Carl Gustaf and Queen Silvia, sporting the Connaught Tiara, led the way. All these different reds are making me twitchy. 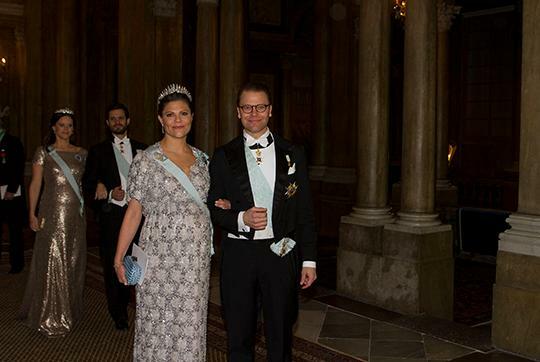 Crown Princess Victoria wore this dress when she was pregnant with Princess Estelle, and I still haven't decided whether it's unfortunately nightgown-esque or pleasingly sparkly cloud-filled sky-esque. Either way, she takes home the prize for Best Tiara of the Night with the Baden Fringe. 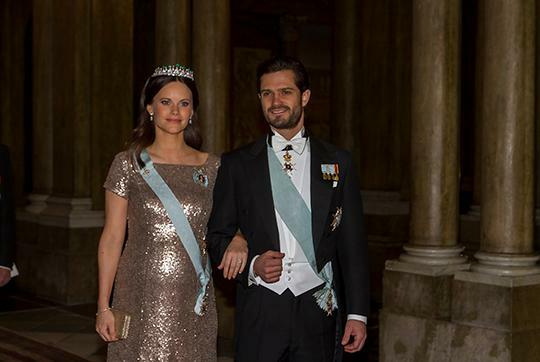 Following through on Victoria's sparkly maternity trend, Princess Sofia went all in with a dress apparently borrowed from a friend (I think I miss the belt the friend wore it with, though). She is again wearing her emerald and diamond wedding tiara, and though she still hasn't used a tiara from the family vault, she continues to wear other pieces (earrings, brooch, bracelet) from the family collection. I can't blame her for giving her in-law's gift plenty of attention, even if I long to see everybody in something different every time. UPDATE: You can see video of the royal family at the dinner here. Victoria's dress is just as alive as the Baden Fringe in motion, and I am now firmly ON BOARD. Also, you get a glimpse of Princess Christina (sadly left out of most pictures) in the Six Button Tiara.